It’s not often that a capital project comes in “On Time” and “On Budget” but this is exact outcome of this Phase 2 Project of Workspaces and Retail Stores. Toronto General Contractors, Power Mechanical completed the project with a minimum of delays and even if they were working against some delays, they made up valuable time elsewhere. Project scope of work included complete demolition of a large existing restaurant to bare walls, demolition of block walls, installation of new store fronts, interior workspace partitions, HVAC (Heating and Air Conditioning ducts to supply and return air), fire sprinklers and complete upgrade of internal security and fire systems. Project took 4 months from start to finish and the result of Power Mechanical’s expertise can easily be seen. 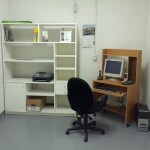 Clean workspace/office is ideal environment for any small Toronto business. All our new tenants found the space to be very attractive and conducive to the work environment. Jiffy Workspaces are like a small mini warehouses that contain both regular entry doors and roll up doors for ease of movement of inventory and supplies. This is more than a convenience. This feature allows the tenant to use the space as an office and if necessary, stock their mini-warehouse/office with goods on or off pallets. 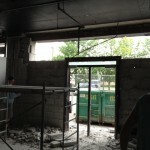 Tenants of workspaces include eBay sellers, paralegal, general contractors, technicians, hobbyist, just to name a few. Many of these small businesses were previously located at the business person’s home (SOHO), but the home space was no longer conducive for operating their business on account of distractions from within. When these home businesses became serious businesses, business entrepreneurs welcomed the variety of sizes of small offices located at Jiffy Self-Storage that are more suited for businesses that outgrew their home environments. New floor-to-ceiling storefronts enhance retail presence. 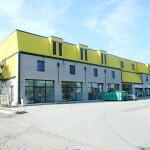 Another feature of locating an office in the Jiffy Self-Storage building, Toronto, is that when the office becomes crowded with inventory, marketing collateral, point of purchase displays, and so on, a storage space can be rented in the storage portion of the building for short or long term storage, without having to enlarge the office space. Retail users at Jiffy Plaza consist of hardware store, all day breakfast, moving store, payday loan and self-storage store. Only a few stores remain that are as little as 400 sf and can be combined up to 1,200 sq ft.